For the kids. 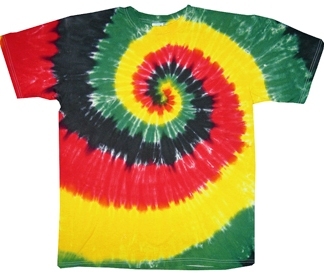 A traditional spiral tie dye t-shirt, reggae rasta style! Hand tie dyed while jamming to Bob Marley! High quality heavy weight cotton T-shirt that is 100% Pre Shrunk/Washed Cotton with colored fiber reactive dyes that stay bright and vivid for years.